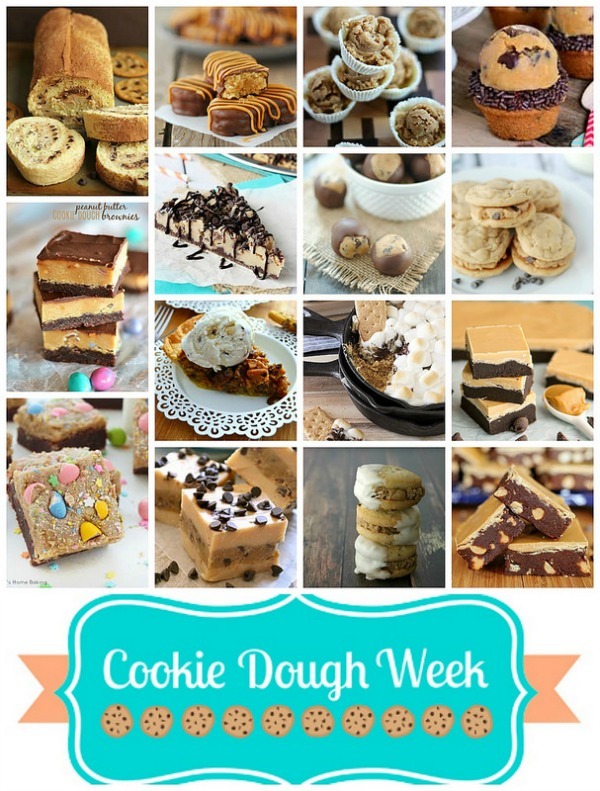 Cookie Dough week is the brainchild of myself and Lindsay from Life, Love and Sugar. We asked a few of our favorite blogging friends to join us in our obsession for all things cookie dough. We don’t discriminate on flavor either. Cookie dough comes in many forms- chocolate, peanut butter, snicker doodle, sugar cookie and the list goes on. We have cookie dough fudge, ice cream, pies, cakes, cookies, dips and candy. I hope you are as excited as we are. I can’t resist taking a bite or five of cookie dough. I mean, I know about salmonella, but in the last 27 years, I have consumed a fair amount of doughs and batters. So far so good, so let’s move on. As soon as I was old enough to realize that I could actually make a cookie dough that was safe it eat, it was like my mind was blown. Now, there is no going back. I add cookie dough to all types of desserts. I have a Biscoff Cookie Dough Cupcake, Cookie Dough Muddy Buddies, Deep Fried Cookie Dough, Cookie Dough Stuffed Donuts and Funfetti Cookie Dough Truffles. 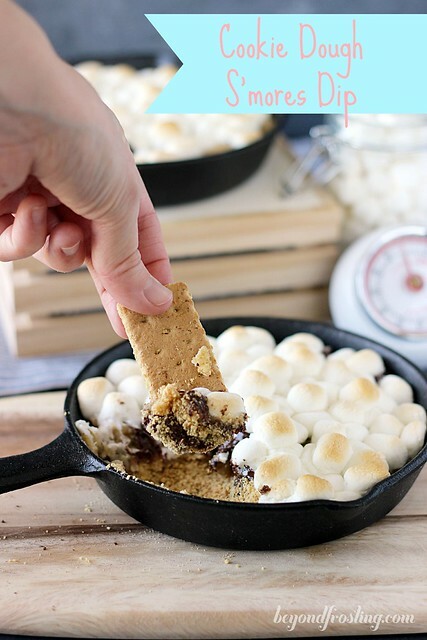 Today, I am sharing a S’mores Cookie Dough Dip. First, you make a batch of eggless cookie dough. 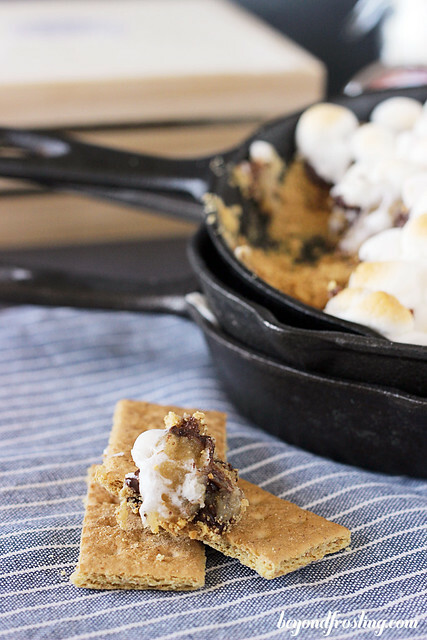 Then you layer the cookie dough on top of some graham cracker crumbs and sprinkle the top with marshmallows. I heated this in the oven for a few minutes to melt the chocolate and toast the marshmallows. The results are pretty amazing. Now the cookie dough does not actually bake, and as such, it is important that you do not mess up and add an egg! 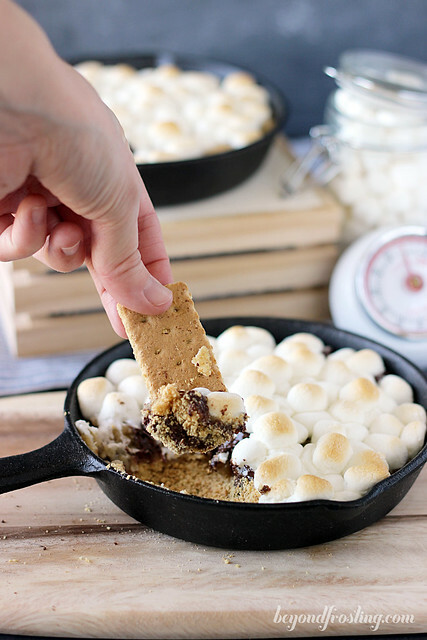 It is heated for the purpose of melting the chocolate and toasting the marshmallows. I will use just about any excuse to use my mini skillets. This recipe makes enough for 2 small (6”) skillets; enough for a small crowd. I guarantee this dessert will be a hit at your next get together. 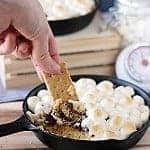 Serve with graham crackers or another type of cookie. Maybe don’t use your fingers though, the skillet is probably hot! Don’t forget to visit all my friends! We have so many good things in store for you! You can either click on the text links or the photos below! 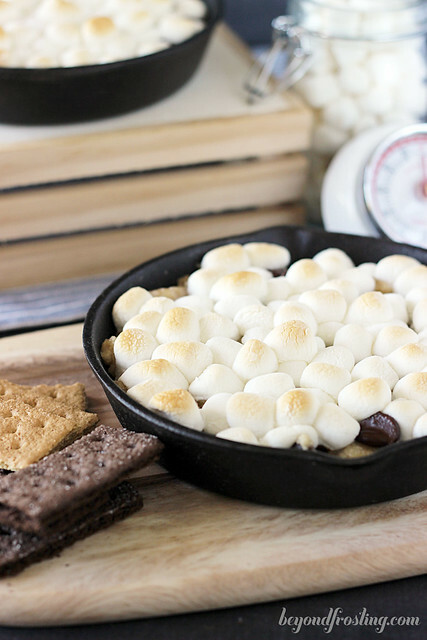 A sweet dip with layers of graham cracker, eggless cookie dough and melted marshmallows. Melt butter in a microwave-safe bowl and mix with graham cracker crumbs. 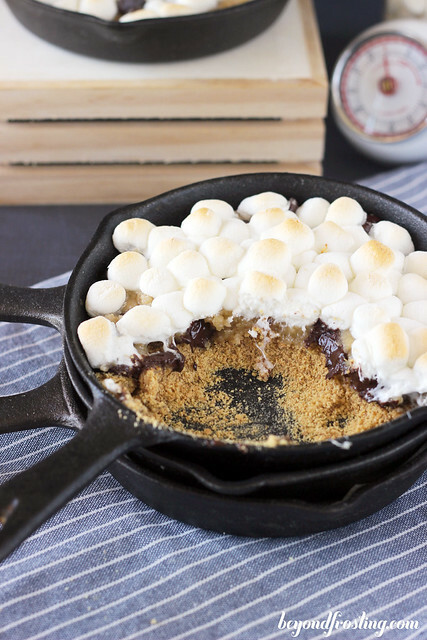 Divide graham cracker crumbs into two 6” skillets, using about 1/4 C of crumbs for each skillet. Divide cookie dough evenly and gently press on top of the graham cracker. Add additional chocolate chips on top if desired. Heat at 425° F for 10-12 minutes to melt the chocolate and toast the marshmallows. Serve with graham crackers or cookies.